We have an overflowing bookshelf containing cookbooks so when we go back to a cookbook a couple times a month or more, it says something. Our go-to recipe for pancakes is in this cookbook and although we often use a lot of substitutions and additions in the “Morning Pancakes,” the recipe makes a massive quantity of delicious pancakes that last us through a week. Even our omnivore family members have complimented us on the pancakes we’ve made using the recipe as a base and adding in spices and chocolate chips. 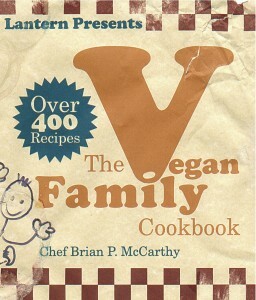 The Vegan Family Cookbook has easy, tasty recipes that are definitely repeatable and family-friendly. The ingredient lists are fairly short with common food items that are easy to find, instructions are simple with most having anywhere from one to seven steps, the layout is clean and simple with easy-to-read font and spacing, each page has one recipe, each of the 12 sections has a table of contents, and the index is well organized. There are no pictures or illustrations, but then again, the book is geared towards every day cooking for families so there is less expectation that a recipe will look a particular way and more emphasis on an easy-to-fix, pleasing, family meal. In the back there’s a glossary, conversion chart, pantry recommendations, and protein list of various foods. In addition to the “Morning Pancakes” we’ve given the thumbs up for the “Pumpkin Pancakes” (my five year old gobbled this up), “Moroccan Red Lentil Soup,” “Split Pea Soup,” “Cauliflower Basil Salad,” “Potato Salad” (although we noted to use less mustard and mayo than the recipe called for), “Roasted Vegetable Medley,” “Grilled Eggplant Sandwich with Roasted Vegetables,” “Thai Wrap” (extra yummy! ), “Red Beans and Rice” (good go-to), “Curry Baked Tofu,” “Asian Noodles,” “Lemon Thyme Marinated Grilled Tofu,” “Teriyaki Tofu” (stellar! ), “Peanut Sauce” (we noted this was on the salty side), and “Stir Fry Sauce” (my daughter liked using this as a dipping sauce but we made note it was a bit too sweet), “Single Pie Crust” (easiest pie crust! ), and “Lemon Nutty Biscotti” (which was decidedly awesome). We did find that some of the recipes like “Morning Waffles” (healthy version, which my daughter gave the thumbs up) and “Indian Lentils Over Rice” were on the bland side. For us, using them as base recipes and adding in spices and flavoring to our taste fixed up the problem. The front cover boasts of “Over 400 Recipes” but some of them made us snort because they were things like boiling artichokes, cooking basmati rice, cooking brown rice, cooking jasmine rice, cooking sticky rice, cooking white rice, pressing tofu, and toasting coconut. We can find instructions for those things on packaging if we don’t know how to do them already. All the basic home favorites are in this book so if you are looking for gourmet or exotic foods, you are looking in the wrong cookbook. The nice thing is the simplicity and organization of this cookbook lends itself well to kids and beginning cooks using it and learning to cook. The ease of the ingredients and instructions are also great for those days or evenings when we are tired and don’t want to be overwhelmed with meal prep and complicated cooking techniques. Yum! Thanks for this recommendation, Hyuen. We are big fans of basic home cooking around here! I had to laugh & nod my head about the book having single ingredient recipes. I recently got a cookbook where many of the recipes were just four lines on a mostly blank page. I do like basic ideas but maybe a “boiling vegetable times” chart makes more sense than a dedicated recipe…? All that said, this sounds great, I have to check it out!